The year 2015 was until now one of the most successful years in the history of Runway 28. There were in total more than 1500 photos published which make 2015 an absolute record year. The year started in Switzerland during the WEF and was soon followed by Frisian Flag and the EART. After a short visit to the Czech Republic, also the THPU at Beauvechain was visited. Besides the always successful RIAT this year also the French Independence Day on 14 July was visited. The visit to Poland can be considered as one of the two absolute highlights of the year. The second highlight was a visit to all the operational airfields in Romania. 2015 was a stunning year. Fliegerstaffel 8 is one of the Swiss Militia units and is currently equipped with the American Northrop F-5 Tiger. The unit is based at Meiringen Air Base in the middle of the country and is part of Fliegergeschwader 13. The militia unit flies only a few weeks a year, because the pilots of the unit are all reservists. The militia pilots have before they joined the Air Force as airman all completed the Air Force training and the full pilot training. Besides the WK, the pilots of Fliegerstaffel 8 take part in the CAP missions during the WEF. During the WEF it is common in Switzerland that one airfield will host the increased operating activities in this period. The responsible airfield for these actions will rotate annually. During this year’s event Meiringen in Luzerne will fly the CAP missions. There are 24 hours a day fighters ready to respond to an alarm. The World Economic Forum (WEF) is an annual meeting of the CEOs of the largest companies in the world. The forum participants are international politicians such as presidents, prime ministers and other intellectuals and journalists. During daytime four fighter planes from Meiringen are continuously in the air for a CAP mission during the WEF. These planes usually consist of two F/A-18C Hornets and two F-5E Tigers which are all armed with live weapons. Only the F/A-18's will fly such WEF missions in the darkness during the evening sorties. The F/A-18s which fly CAP missions armed with live weapons under the wings. Under the fuselage of the Hornets is a large fuel tank positioned with the text STBY 121.50. The two Tigers are also armed with live weapons. The airfield of Stans is also known as the former Buochs Air Base. The factory of the Swiss aircraft manufacturer Pilatus is located at this airfield. In this plant are currently especially the PC-21 and PC-12 constructed for a variety of civilian customers and air forces around the globe. In addition to the hall where final assembly is done, there is a testing facility where regular aircraft will start their engine for the first time. There are currently PC-21s being built for the Air Force of Saudi Arabia and the Air Force of Qatar and PC-9s for the Air Force of India. The Eurocopter EC635 is a small multipurpose helicopter which is developed by the Eurocopter Group as a military version of the Euro- copter EC135. At Lufttransportstaffel 8 the EC635 is next to the operational military tasks, like the SAR mission, also used for the training of new helicopter pilots of the Swiss Air Force. The Eurocopter EC635 is a multipurpose helicopter which is developed by the Eurocopter Group as a military version of the Eurocopter EC135. In April 2006, ARMA Suisse ordered 20 EC635s for the Swiss Air Force. Drohnenstaffel 7 is the youngest operational unit of the Swiss Air Force. The unit is responsible for the exploration of enemy terrain with the help of ADS95 Ranger. This unmanned aircraft is a small radio-controlled drone which is able to collect and to send data live as detailed information of explored areas. Drohnenstaffel 7 is the only Swiss unit which operates unmanned aircraft. The unit has been ope- rational since 2001 and has 28 Drones of the type Aufklärungsdrohnen- system 95 Ranger (ADS 95 Ranger) for reconnaisance flights. The World Economic Forum (WEF) is an annual meeting of the CEOs and other officials of the largest companies in the world. The participants of the World Economic Forum are international politicians such as presidents, prime ministers, ministers and other politicians, intellectuals and independent journalists. The World Economic Forum (WEF) is a Swiss non-profit foundation which is based in Geneva, Switzerland. The forum defines itself as an independent international organization committed to improving the state of the world. Dübendorf Air Base plays an important role during the WEF. The helicopters which are stationed at this basis are used to actively support the WEF. This means the helicopters of Lufttransportstaffel 3 will perform more flights than usual. Helicopters are continuously flying from and to the military platform at this airbase. Often, the helicopters are temporarily lent to the police in Switzerland. The helicopters which occur additionally to the police, also wearing "Police" markings on the doors of the helicopter. The helicopters fly the VIPs directly to Davos. The Operation Atlantic Resolve took place parallel to the exercise Frisian Flag. Several units from the United States are stationed in Europe during this intensive operation. The United States and its European partners are showing the strength of the NATO members to Russia which is seen as the aggressor in Ukraine crisis. The Ame- ricans want to show their solidarity with Europe in this way when it comes to their NATO obligations. Many of the exercises are taking place in the former Eastern Bloc in the Eastern part of Europe. During the exercise Frisian Flag, many air-to-air and air-to-ground scenarios are practiced by units of the Dutch Air Force and its partners in two weeks’ time. One of the most prominent participants in this year's edition of the exercise are the Americans who fly along with twelve Air National Guard F-15 Eagles. The annual exercise Frisian Flag was launched on April 13 and lasts until April 24th. The purpose of Frisian Flag is to train pilots on international cooperation. The practice areas are over the Netherlands, Germany and Denmark. In the coming years, a lot will change for the European tanker units. A joint tanker fleet will be established with the European partners in the near future. The need for such a fleet became clear during the European Air Refuelling Training. This training is held for the second time this year held at the Dutch Eindhoven Air Base. In the period from April 13 until April 24, 2015, the European Defense Agency (EDA) organized for the second time the European Air Refuelling Training. The training is hosted by the EATC based at Eindhoven Air Base. The Aviation Museum of Prague is located next to the military airbase Kbely northeast of the city of Prague. Kbely was in the past an air base of the Air Force of Czechoslovakia. The Czech transport aircraft of the Air Force are nowadays stationed on this basis. In the mid 60s, the museum was founded by the government. The museum in Kbely is therefore the official Air Force Museum. There are a total of over 100 aircraft present in this museum. Admission to the museum is free for visitors and the aircraft in this museum are in a very good condition. The Czech Aviapark is located near the city of Plzen in Zruc in the west of the Czech Republic. The Aviapark is a small museum which contains a private collection of mostly Czech military aircraft. The museum is small in size and is literally crowded with many aircraft on a too small area. The Aviapark was founded in 1993 and in subsequent years it has grown into an extensive collection of aircraft. The planes in this museum are due to the crowded park often in a very bad condition. Many aircraft are damaged and are missing a lot of parts. After the contract for the procurement of the NH90 was signed in late 2007, the NH90 helicopters have now all been delivered during 2014 and 2015. The first crews of the helicopters are now in the conversion training from the A-109 to the NH90. This training consisted of some necessary trainings and qualifications. Only since 2014, the Belgian air component received its first NH90 helicopters. The NH90 operations will be coordinated and maintained at Beauvechain Air Base. 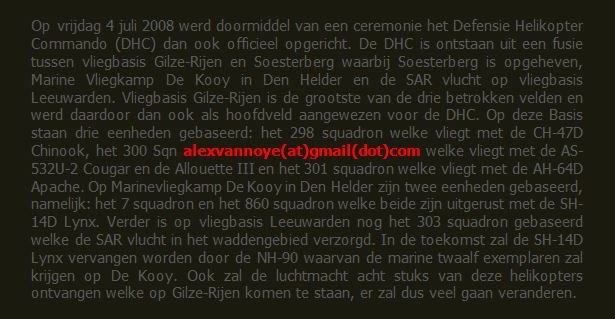 Only an operational SAR detachment will be stationed at Koksijde Air Base. The NH90 in Belgium was initially declared operational during the Tactical Helicopter Procedure Update (THPU) at Beauvechain airbase. The helicopters are fully operational from this point for all national and international tasks in peacetime. A demonstration of the capabilities of the NH90 was given at the ceremony. The THPU exercise was held in the week from May 18 until May 22, 2015. This exercise is a refresher course for the helicopter crews in applying the existing international procedures. The THPU is held as preparation for Italian Blaze. On the German airbase Celle are the last still operational Bölkow helicopters of the German Army stationed (Heeresflieger). The Bölkow is at the German Army in its last year of its operational lifetime. From 2016 onwards, the helicopters will be phased out. Currently there are more than 70 Bölkows in storage at Celle. These helicopters are here waiting to be sold to a new owner or eventually scrapped if no customer can be found. The Bölkow is currently only used by the Heeresfliegerwaffenschule C (Army Helicopter Flying School) in Celle. During the parade in Paris a large formation of all French aircraft and helicopters will fly over the Champ Elysees in the center of the city. Particular flying in a formation with a large group of aircraft is not easy. The French Air Force has therefore practiced the formation several times before the parade. The French national holiday La Fete Nationale is abroad also known as Bastille Day. The day is annually celebrated in France on July 14. The storming of the Bastille in Paris is commemorated on this day on which the French Revolution started. During the Defilé Aérien above the Champ Elysees more than 55 aircraft and 31 helicopters from the various French air forces will fly in one formation. All of these participants in the formation represent a specific part of the French Air Force, Army and Navy. The flying part is only a small part of the entire military parade. The Defilé Aérien de l'Armée de l'Air (Aerial Parade of the French Air Force) will be launched over the Champ Elysees in Paris at 10:40 am. The opening of the parade in Paris is flown by the Patrouille de France (PDF). During the national holiday on July 14th was the traditionally small scale airshow held at Valenciennes. This airshow is organized by the flying club which is located at the small airport in northern France. The airfield is located in the area of Cambrai. The airshow is small, but despite this the organizations knows to get a few nice military partici- pants every year for the program. This year’s participants were the Fouga Magister, the Red Devils with their Marchetti's, Cartouche Dore with their Epsilons, the Rafale and the Patrouille de France (PDF). The Bell Boeing V-22 Osprey is the first aircraft in the world which was developed and eventually produced according to the so-called tilt-rotor concept. A tilt rotor is a special type of propeller which allows an aircraft to take off and land vertically like a helicopter and to fly horizontally like a conventional airplane. The Osprey has over twice the speed , three times the payload capabilities and a five times larger operational range than the best transport helicopters in the world. The aircraft replaces the CH-53 Super Stallion and the CH-46 Sea Knight. The Fairchild Republic A-10 Thunderbolt II is a fighter built by Fairchild which is only in use at the US Air Force. It is the only USAF aircraft which was developed primarily for the Close Air Support (CAS) mission. The Thunderbolt is specially equipped for destroying armored vehicles and ground targets from a close range. The Republic A-10 Thunderbolt can be used against moving ground targets and targets which are further from the troops removed. A secondary task which can be fulfilled by the aircraft is acting as flying Forward Air Controller. In 2011 a draft was prepared by the consortium between Textron and Airland for a cheap combat aircraft. The aircraft would become known as the Scorpion and is suitable for the Interdiction, Surveillance & Reconnaissance role. The aircraft should be a cheap alternative to the often expensive combat aircraft. When a suitable client would be found, the Scorpion could already go into production in 2015. The biggest challenge for the team is to find a number of customers as quickly as possible at this time to sell the Scorpion to other countries. The Polish Air Force is referred in Polish to as Sily Powietrzne which literally means air force. The Air Force of Poland is one of the military branches of the Polish armed forces. The Polish Air Force would be established as a result of the First World War. Poland has a rich aviation history and great fame was especially during the Second World War gained. During the interwar years, the Polish aviation industry would make great steps in this period. The young Polish Air Force became quickly a large force and well equipped air force. During the Cold War, Poland would be part of the Warsaw Pact. Almost all types of aircraft which were in use at the Polish Air Force were during this period from Russian origin. Besides these aircraft also the Polish aviation industry would receive a boost, because many Polish Air Force aircraft were built by the Polish PZL. The post war Communistic Polish Lotnictwo Ludowego Wojska Polskiego (Polish People's Army Aviation) was founded in 1943 by Polish patriots who wanted to liberate their country from Nazi Germany during the war. The 1 Tactical Air Wing is a small self-contained air force within the Polish Air Force. The wing is able to perform all combat tasks and consists of aircraft like the MiG-29 "Fulcrum" which is responsible for the air defense of the Polish airspace and the Su-22 "Fitter" which is used for the offensive tasks of the air force. The first tactical wing of the Polish Air Force is in Polish referred to as the 1 Skrzydło Lotnictwa Taktycznego (1.SLT). The 1.SLT is a direct descendant of the third Brandenburg Fighter Division from the early days of the Cold War. The 2 Tactical Air Wing is the most modern and youngest wing of the Polish Air Force. The squadrons of this wing are equipped with the Lockheed Martin F-16 Fighting Falcon. Like the 1 Tactical Air Wing also the 2 Tactical Air Wing is able to operate both in the air defense role as the offensive role with the help of the F-16. The second tactical wing of the Polish Air Force is in Polish referred to as the 2 Skrzydło Lotnictwa Taktycznego (2.SLT). Like the 1.SLT is also the 2.SLT a fully self-contained mini air force within the Polish Air Force. The transport aircraft of the 3 Tactical Airlift Wing is responsible for the logistical connections through the air. The American Lockheed C-130 Hercules is the workhorse of the Polish Air Force. In addition to the Hercules the Spanish CASA C-295 is used as a tactical transport aircraft and the PZL M28 as a light transport aircraft. The command which is responsible within the Polish Air Force for all logistics and transportation services by air is the 3 Skrzydło Lotnictwa Transporto- wego (3.SLTr) (3 Airlift Wing). The 3.SLTr was founded in 2008. Besides the transport aircraft of the 3 Tactical Airlift Wing also several transport helicopters are in use at this unit. These helicopters are used for transport duties and for the commitment of the Polish Special Forces. Also part of the helicopter fleet of the Polish Air Force will be used for VIP and government transport in Warsaw. The Search and Rescue (SAR) groups are stationed at several airfields in Poland. In total there are three SAR groups which are scattered throughout Poland and are all reporting to the high command of the 3.SLT. The only Polish aviation flying school is in Poland referred to as the 4 Flying Training Wing. The main task of this training wing is the education of all military pilots of the Polish Air Force. The Polish 4 Flying Training Wing is stationed at the airfields Deblin and Radom. Only training aircraft are stationed at these two airfields. The pilot education and training program of the Polish Air Force is the responsibility of the 4 Skrzydło Lotnictwa Szkolnego im. gene. Bryg. pill. Witolda Urbanowicza (4.SLSz) (4 Wing Aviation School). In addition to the Polish Air Force, also the Polish Army has an airborne unit. The Polish Army Aviation battalions consist exclusively of helicopters and are fully integrated into the Polish Army. The unit is the 1 Brygada Lotnictwa Wojsk Ladowych (1st Army Aviation Brigade) which is operating in the offensive role. The history of the Polish Army Aviation goes back to the early 60s. In this period many helicopter units emerged throughout Europe. The flying branch of the Polish Army is referred to as the Lotnictwo Wojsk Ladowych (Army Aviation). The 25 Brygada Kawalerii Powietrznej (25.BCPow) is the airmobile brigade of the Polish Army. The brigade is composed of two units which fly helicopters of the type Mil Mi-8/17 "Hip" and PZL W-3 Sokol. In addition, the 25 Cavalry Brigade also contains two cavalry battalions of the Polish Army in its organizational structure. The second brigade in the Polish Army which is equipped with helicopters is the 25 Brygada Kawalerii Powietrznej (25th Air Cavalry Brigade) (25.BKPow). The 25.BKPow is the only airmobile brigade of the Polish Army. The Polish Navy is able to defend and patroll the Polish maritime areas. Defending and guarding the coastline is an important part of this organization of the Polish Armed Forces. Besides the ships, the Polish Navy has also a fleet of aircraft and helicopters in operational service. These aircraft are based on the airfields Gdynia, Siemerowice and Darlowo. The Polish Navy is referred to as the Marynarka Wojenna (MW) and is one of the four forces of the Polish armed forces next to the Polish Army, Polish Air Force and Polish Special Forces. The Romanian Air Force has a long history with the Cold War as the highlight days. Nowadays, the Romanian Air Force is a modern European air force which is operating in an international European context. Since 2004 the country joined the NATO. Romania made a long journey of reformations to reach this point since 1990. The Romanian Air Force, which is referred to as the Forţele Aeriene Române, is the air force branch of the Romanian Armed Forces and is today a modern air force which in recent years has invested heavily. During the Cold War, Romania was one of the member states of the Warsaw Pact. This military organization was the counterpart of the Western NATO and consisted of the Eastern European countries. This period was the highlight days for the Romanian Air Force in which were many types of aircraft in active service. During the Cold War much would change in the structure of the Romanian Air Force. The entire organization of the Air Force was set up according to the brigade and regiment organization structure of the Soviet Union. The initial flight training of the Romanian Air Force will take for the largest part place at Boboc. At this airbase both the helicopter pilots and the fighter pilots undergo their initial pilot training. For the training of new pilots the Romanian Air Force is using the IAK-52, IAR-316 Allouette III and the IAR-99 Soim. The flight school is named after Aurel Valicu. This man was an aircraft pioneer at a time when aviation was still in its infancy. His name is honorably associated with the school, because he was important for the Romanian aviation branch. Once the pilots have completed their initial pilot training at Boboc, they will go to Bacau for the advanced operational pilot training. The helicopter pilots will learn to fly here on the IAR-330 Puma and the IAR-330 Socat. The tactical fighter pilots learn to fly with the IAR-99 and later the MiG-21 at the operational units. Bacau was founded on June 17, 1920, with the aim to improve pilot training for the Romanian Air Force. Only since 1968 during the Cold War, the role of the air base would be fully focused on the training of military fighter pilots. After Romania turned its interests to the west in the early 90s, it was decided to modernize the existing MiG-21 fleet. The MiG-21 LanceR A was the first updated version which entered service in the Romanian Air Force for the offensive tasks. The two-seater MiG-21 LanceR B is used for the training of the MiG-21 pilots. The LanceR is a dramatically upgraded version of the MiG-21 Fishbed. The idea to update the MiG-21 started at the beginning of the 90s when Romania turned clearly its focus on the West and the NATO after the fall of the Soviet Union. The MiG-21 LanceR C is the main variant of the LanceR series. This aircraft type is used for the air defense of Romania. There are two operational airbases in Romania where the LanceR C is stationed, namely Campia Turzii and Fetesti-Borcea. The reserve airbase is Mikhail-Kogalniceanu. In addition to this task of the air defense is the LanceR C also able to carry air-to-ground weapons. The camouflage pattern of the LanceR C consists of three tones of gray. The bottom of the LanceR C is like that of the other MiG-21s blue for low visibility. Since joining NATO in 2004, much has changed for Romania as a country. Romania had an extensive preparation before they joined NATO. The Romanians took part in the Baltic Air Policing in 2007. Since the escalations with Russia in 2014, there are also permanent USAF detachments in Campia Turzii. One of these detachments at the airbase was from July 6, to September 30, 2015. It contained the detachment of the Oregon and Florida ANG. These units flew a total of 12 F-15C Eagles which participated during Dacian Eagle 2015. On several Romanian airbases is a unit stationed which flies the IAR-330 Socat. This modified helicopter type is a modernized version of the IAR-330L Puma and can be used for offensive tasks. There are also often SAR and transport helicopters present of the type IAR 330L. This helicopter type is in use since the 70s. Despite the fact that Romania was a Warsaw Pact State, the country also wanted to remain independent from the Soviets. Instead of buying Russian aircraft, Romania had chosen to build Western helicopters under license. The Romanian airbase Otopeni is the home base of the Romanian transport fleet. The big workhorse of the fleet is the American C-130 Hercules. In addition to the C-130 Hercules the Romanian Air Force also has the C-27 Spartan. These small tactical transport aircraft are nowadays the most widely used aircraft. In 1996 the unit was renamed to Baza 90 Transport Aerian "Comandor Aviator Gheorghe Banciu- lescu". This name was given in honor of a famous Romanian pilot who had two wooden legs and flew over a distance of more than 9,000 km. Since Romania joined the NATO, many things have been changed in the country. The largest change in the Romanian Air Force is the purchase of the American Lockheed Martin F-16 Fighting Falcon. Romania has bought twelve F-16s from the Portuguese Air Force. The F-16 will eventually enter service in Romania in 2016. The LanceR is nowadays an aircraft which is becoming outdated and the airframes are starting to degrade. In addition, Romania has the ambition to integrate more and more within the NATO structure in Europe. During a holiday in Spain and France in September 2015, the necessary Wrecks and Relics were photographed. The first aircraft which was captured on photo was a former Russian Air Force MiG-15 “Fagot”. In France a number CM170 Fouga Magister training aircraft were captured on photo. In Spain there were a number of Czechoslo- vakian and Hungarian MiGs found in a field next to a farm. At Reus airport near Barcelona was a T-33 T-Bird of the Spanish Air Force preserved. Also along the coastline a few aircraft were preserved. On Monday, October 19, the 3 Regiment d’Hélicoptères de Combat (3RHC) was visited at the French ALAT base Etain-Rouvres. This air base is located in the northeast of France near the border of Luxembourg. Several Gazelle and Puma units are assigned to the 3RHC at Etain. The 3RHC is also referred in France as the night squadron of the French ALAT. Unfortunately, during the visit at Etain there was no flying activity due to bad weather. However, there was only one Puma of the AdlA been photographed while it was leaving. Also this year Gilze-Rijen Air Base was visited again for numerous times. The year at Gilze-Rijen started with a visit of a NATO C-17 Globemaster III from Papa Air Base in Hungary. This C-17 delivered several helicopters of the DHC for an exchange for the Dutch deployment in Mali. No less than four Belgian Air Force Alpha-Jets came in at Gilze-Rijen for a full stop at the end of June. It was a long time ago that these aircraft had visited Gilze-Rijen Air Base. The year at Gilze-Rijen ended in December with a visit of two British Sea-Kings. Also in 2015 Eindhoven Air Base was visited several times. Eindhoven Air Base in the Netherlands is each year the airbase with the largest amount of military visitors. At the beginning of April, Eindhoven was visited by a Colombian DHC-6 which had just been painted in the colors of the national narcotics police at one of the civilian company’s at Eindhoven. At the end of June as many as three French Alpha-Jets visited Eindhoven. These aircraft provided the necessary nice pictures. The year ended with a visit of a NATO C-17 from Papa in December.